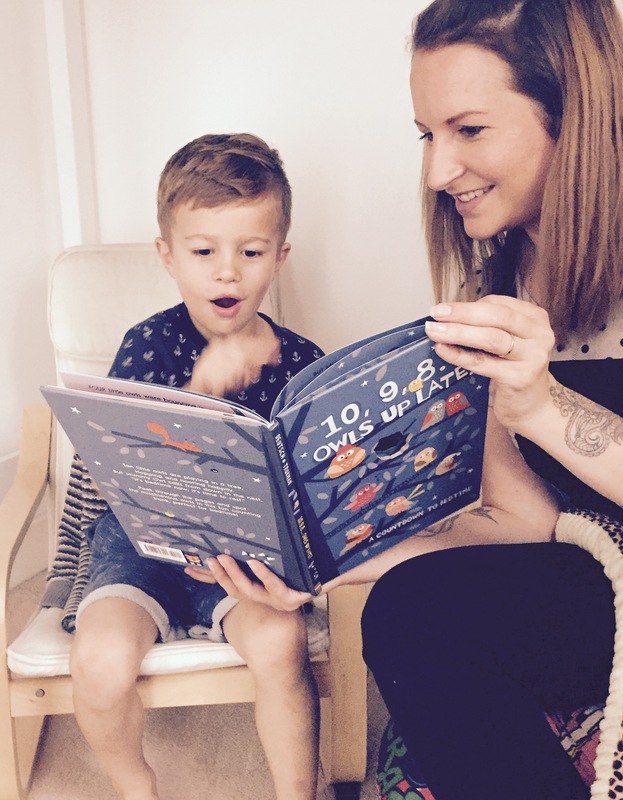 A beautifully illustrated book, teaching counting skills which concludes with a cosy ending, making it the perfect bed-time book. I was recently sent a wonderful book by Georgina Deutsch and illustrated by Ekaterina Trukhan called 10, 9, 8… OWLS UP LATE. It’s an A4 sized hardback book with beautiful cut outs and colours that create intrigue, fun and relaxation. It’s ideal for children who like the owlets are reluctant to sleep. It uses the concept of counting owls to make bedtime fun, educational and relaxing. Fin absolutely loved this book, and I must admit, I don’t read with him as much as I probably should (bad mummy), but this was a pleasure! We’re struggling a little bit with his bedtime at the moment as he doesn’t like to fall asleep alone, and when he does, he wakes up and does a zombie walk up the stairs to our bed! Last night he got into our bed at an unknown time with his Heelies on! I was a bit sore when I woke up, due to being kicked to death by him in the night! Georgina Deutsch’s soothing use of rhyme combined with the peep-through images adds an intriguing and interactive element, revealing different animals wih amusing expressions. The helful counting guide at the end of the book teaches children numbers, with Ekaterina Trukhan’s owl illustrations offering a wonderful visual aid. Tonight, I am going to read the book with Fin again, and see if this helps to calm him down again, as this was enough to get him to be ok with me leaving the room. I’m kind of embarrassed to admit that my 5 year old can’t fall asleep by himself, but we are getting there. I’d definitely check this book out if you’re looking for a lovely soothing and uplifting bedtime story. The RRP is £10.99, and it would also make a lovely gift. Thank you to Little Tiger for sending me 10, 9, 8… OWLS UP LATE to read with my children.